We really don't want to know how it happened, but somehow a hybrid of a zombie and a living doll has crawled up from the depths of Hades to make sure that none of us are able to sleep again. Ever. Because if you were to take a survey of "the last thing you want to see standing over your bed at night," both "living dead" and "living doll" would be at the top of the list. But think of a combination of both... a Living Dead Doll! Nothing could be scarier. So If you really want to spook people this Halloween, become the most horrifying thing imaginable with the help of this Zombie Doll Makeup kit! 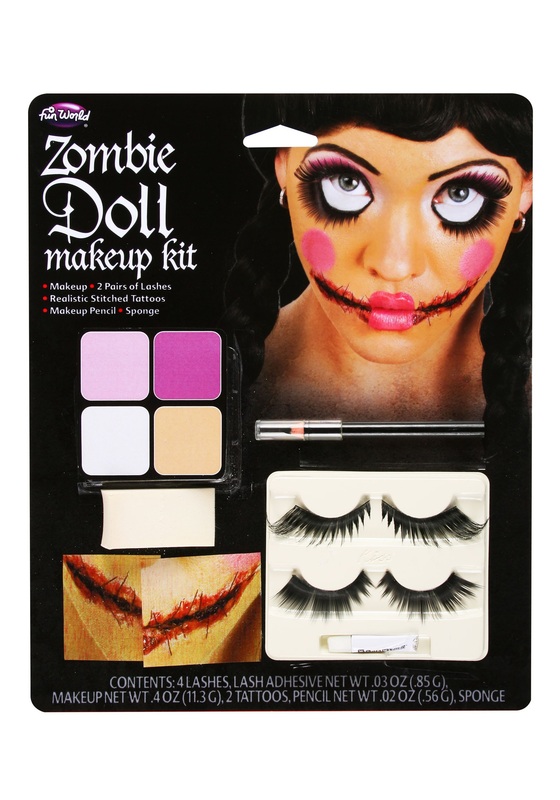 It's got everything you need to transform into everyone's worst nightmare, including giant doll eyelashes, grotesque "stitch" tattoos, and all the necessary makeup gear to tie it together. The Zombie Doll Makeup is a great way to put a scary and unforgettable twist on your old "Raggedy Ann" costume!